Ignoring Friction: "Flying Under the Radar"
The stealth bomber is an incredible and awesome aircraft. It is officially named the B-2 Spirit bomber. This aircraft was the result of a project that aimed to create an aircraft capable of carrying nuclear bombs across the world in a short period of time without being detected by enemy radar. In the 1970`s the United States military wished to replace the B-52 bomber with a plane that had these characteristics.This was an extremely hard task seeing that no aircraft like this had ever been invented. Northrop Grumman spent billions of dollars over a 10 year period constructing the first B-2 in secret. We will go into the science behind the technology of this awesome aircraft. 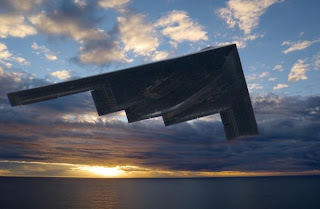 The most impressive component of the B-2 spirit is that it is undetectable by radar. Radar is the use of reflected electromagnetic waves to detect targets. Detection starts by sending out an electromagnetic pulse in the target's direction. If any energy is reflected off an object a receiving antenna will collect it. By comparing the delay time between sending and receiving, information about the target's location and shape can be derived. Stealth is achieved by absorbing or deflecting electromagnetic radar. The B-2 spirit is made of a composite material that has a radar absorbent surface. Therefore, when flying through enemy airspace it can not be detected by the enemy's radar because the composite material actually absorbs some of the radar. 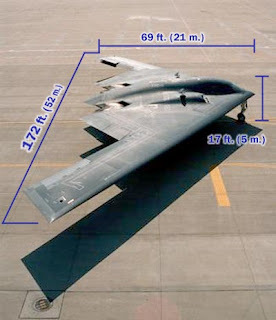 Furthermore, the stealth bomber lacks flat vertical surfaces which act as radar mirrors. Instead, it is highly angled and streamlined which allows radar to be deflected away from radar recievers. Additionally, metal screens were placed over the intake vents of the engine which helps to absorb radar waves and reduce heat signature. Another component of stealth is silence, or the inability of the enemy to hear the aircraft as it makes it approach. The engine of the B-2 is actually buried inside the plane, which minimizes the noise of the engine. Also, when a mission is executed during the night, the black color of the stealth blends in with the dark sky, making it nearly invisible. The stealth bomber has given the United States a huge advantage in air force technology and defense in general. Our military actually has the capability to enter enemy lines completely undetected. This aircraft takes advantage of anti-radar technology making it undetectable by radar. Its airfoil design generates optimal lift allowing it to travel at very high speeds for long distances. This air craft is also very deadly. The B-2 carries all its weapons internally and is fitted with 2 separate weapons bays in the center of the aircraft. It can carry 40,000 lbs of weapons, including conventional and nuclear bombs, precision-guided munitions, gravity bombs, and a range or maritime weapons. Each weapons bay is equipped with a rotary launcher and two bomb-rack assemblies. In tests, the b-2 bomber dropped B-61 and B-83 nuclear and Mk 84 conventional bombs from the rotary rocket launcher, and Mk-82 and CBU-87 conventional weapons from the bomb racks. The b-2 can carry the AGM-129 advanced cruise missile, which is a strategic cruise missile with a range of up to 1,500 miles. Overall, the stealth aircraft is able to destroy even small targets with precise accuracy as well as large targets with massive and destructive bombs. The stealth B-2 bomber has been used in several military campaigns. It made its debut during Operation Allied Force in the Kosovo war in 1999. It destroyed 33% of selected Serbians bombing targets in the first eight weeks. These missions consisted of flying from the U.S. to Kosovo and back non-stop. At the conclusion of this war, the stealth became the first aircraft to deploy the Global Poistioning System guided JDAM in combat. The aircraft was also utilized in the ongoing war in Afghanistan. The B-2 stealth also completed combat missions in support of Operation Enduring Freedom in Iraq, flying 22 sorties from a forward operating location as well as 27 sorties from Whiteman AFB in Missouri and releasing more than 1.5 million pounds of munitions. The B-2 is a perfect military aircraft. The creation of the B-2 spirit has allowed the United States to effectivley execute missions across the globe with minimal loss of American lives and maximal destruction of targets.